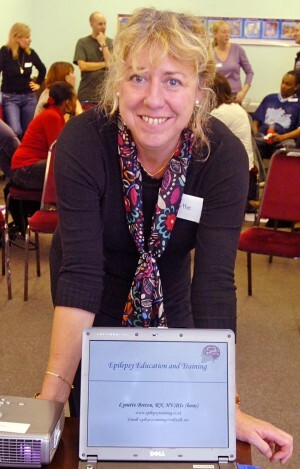 Epilepsy Education and Training was formed in 2000 by Lynette Breton (then Lynette Couldridge) a registered nurse, health visitor and qualified teacher. The aim being to provide high quality and accessible epilepsy training for anyone with a personal or professional interest in epilepsy or caring for a person with epilepsy. The company is now an established and very well respected training provider delivering courses to a wide range of organisations nationally. Lynette was employed for 10 years at the National Society for Epilepsy (now Epilepsy Society) the first four years on the medical unit as a staff nurse caring for people with epilepsy and for six years in a combined role as a nurse researcher and epilepsy trainer. During this time Lynette co-ordinated several major epilepsy research projects in conjunction with Buckinghamshire Chilterns University and developed and delivered the external epilepsy training programmes for the Epilepsy Society. Much of this work has been published in peer reviewed journals (CLICK HERE for more information) and some of the evidence has been used to support the development of the National Institute of Clinical Excellence (NICE) guidelines for epilepsy and is referenced in this document (CLICK HERE for more information). Lynette has presented much of her research work at research meetings and conferences as well as in epilepsy circles and maintains strong academic links being a member of the Thames Valley Primary Care Research Network and currently reviews academic and research papers for publication in medical and nursing journals. In both her employed and freelance training roles, Lynette has developed and delivered a range of epilepsy and first aid training programmes such as Epilepsy Awareness and Seizure Management Courses, Epilepsy and Rectal Diazepam Courses, Train the Trainers Courses and general First Aid. From 2009 Lynette has been employed part time by the University of East Anglia, School of Medicine, as a researcher on the 'Healthy Water Study' (published in 2012). Lynette also maintains her role as a reviewer for epilepsy and nursing research publications for the University of Hertfordshire. Lynette began her nursing career in epilepsy in 1990 whilst still a student nurse and studying for her diploma and BSc (hons) in nursing, having qualified she continued nursing in a specialist epilepsy centre. In addition she qualified as an aromatherapist, using this therapy with good effect to complement medical treatment and nursing care for people with epilepsy and others. Lynette has written papers on the benefits of complementary therapies for people with epilepsy (unpublished dissertation 1994). As a qualified and practicing health visitor Lynette gained valuable community and family nursing experience promoting family health and monitoring child development, as well as becoming a nurse prescriber. In recent years her role as an Epilepsy Practice Nurse has involved working closely with general practitioners in a primary care setting to provide a weekly epilepsy clinic for patients and their families and conduct their annual reviews. As a UKCC registered nurse, Lynette maintains the PREP requirements both for clinical practice and education. A portfolio of ongoing education in her specialist field is maintained and includes attendance at many professional study days and conferences to the required standard, clinical practice requirements are maintained through her ongoing epilepsy clinic caseload. We are pleased to recommend Lynette as a Trainer in Epilepsy Care and the Administration of Emergency Rescue Medication. Lynette has an in-depth and up to date knowledge of the topic along with extensive clinical and training experience. Lynette's training evaluations are always excellent, she is well able to present to audiences ranging from families and carers of those with epilepsy through to nurses and GP's. Lynette has worked for a wide range of external clients and her training is highly regarded. Lynette constantly develops her epilepsy knowledge and practice to stay up to date. P.J. Chartered FCIPD, Epilepsy Society.